The one I probably use the most is Show Anchors, which I made. It shows an anchor icon next to every element on the page that can be linked to directly. Sounds stupid, but it's very useful when you want to refer someone to a specific section of a website. And it's much easier than trying to figure out where the site owner put their anchor links (if they even did in the first place). I found this on GitHub. It's fun and likes to get my mind off things and also get rid of them! Rewrites most shortened URLs on a page to show where they will take you. I use SuperGenPass to hash my master password into unique passwords for the sites I visit (the hash is based on the domain). Very convenient. TinEye bookmarklet for finding other sources for images on a webpage. BugMeNot to quickly bypass the login of web sites that require compulsory registration and/or the collection of personal/demographic information (such as the New York Times). This is a little bit like Quicksilver for the web. It's very useful for web development. You can also configure Chrome to use it as a search engine to turn the address bar into a command line. I use StackPrinter bookmarklet; it allows to print Stack Exchange questions (like this one) in a printer-friendly way. jQuerify is the bookmarklet I can not live without. Adds (if necessary) jQuery to the list of scripts on the page. Makes writing other little bookmarklets much less painful! I use a couple of bookmarklets (named + and -) to quickly increment or decrement the page of an article I'm reading. PrintLiminator - Similar to other printing bookmarklets, but lets you select elements to remove from the page. This code will show your upvote count for all tags that appear in your user page's top tags section. It should work on any Stack Exchange site you are logged in on (but I've only tested it on Stack Overflow and Meta Stack Overflow). Unfortunately there is a bug in the tag synonym redirection logic that will keep this script from working with tag synonyms. Remember password to remove autocomplete="off"
I have a large screen. Some websites don't limit the maximum width of the content. That often makes long texts unreadable. So my favorite bookmarklet is this. It limits the maximum width of the page. I use it to see the box model for any element on any web page. Eventually Zap Colors gets installed on any browser I use. Gray text on a black background? Zap and it's suddenly readable. Anyone who likes bookmarklets should have a look at the iMacros Firefox and chrome extensions. 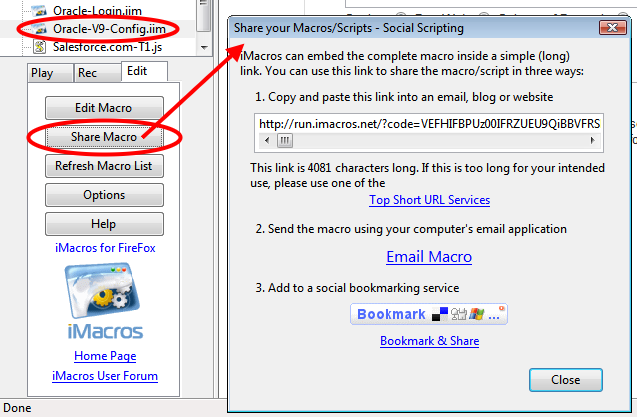 They let you create "macros" (kind of like huuge bookmarklets) to autoamte task. We use them for all kinds of "stuff" in the office. Coralize for adding a site to the Coral CDN before it gets slashdotted. I use Diigo and the diigolet on safari, they have a toolbar for some browsers though. If you're a web designer, or someone who loves typography, you'd enjoy Font Friend bookmarklet. Not the answer you're looking for? Browse other questions tagged browser bookmarklet browser-addons or ask your own question. Is there another IE streaming service similar to Spoon? Why do none of the web apps I use open in full-screen Safari mode when I add them to my home screen? What tools can I use to check what sort of information is shared about me with websites? Can AdBlock interfere with Facebook login?